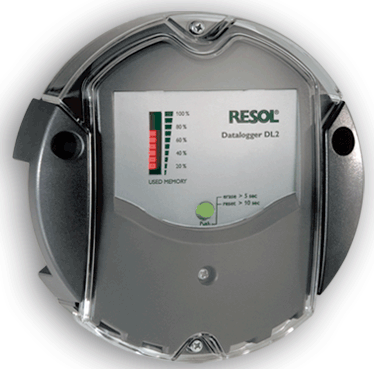 The Resol DL2 is a data-logger and web interface for the Resol range of solar controllers, plus some other (similar) stuff they do. The controllers use a proprietary serial bus for communication called VBus, and the DL2 is a way of getting remote access to the information the controller (or group of controllers) connected to it, plus storing this data to an SD card which you can remove or download from. 1. 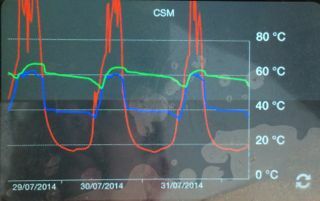 Collect more historic data which can be viewed in graph form real-time. 2. 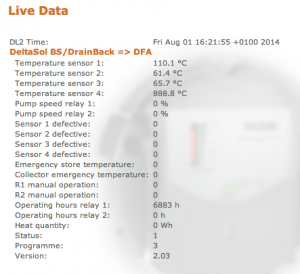 Make decisions based on the water temperature at particular times of the day. 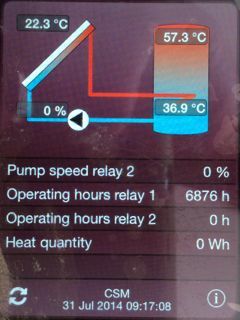 For example, turn on the heating to top up the tank with hot water, but only on a cold day when I know there is no sun coming. I figure that by collecting this data into Freedomotic I can achieve this at some point. But first it has to be collected..
As you can see from the image, the version I am running is 2.03. Resol have a later version which connects to their cloud system but I would have to pay for the upgrade. I asked them if the JSON is still there, but they told me I should use the daily data download function (which obviously won’t give me real-time data). So, I can take this output to collect the info I need into Freedomotic using a custom plugin, and publish it on the event bus to make use of. I decided to make the module flexible enough to collect data from as many devices as there are connected to the DL2, but also so you could specify which info you wanted. You can set this up in the manifest.xml config file. Next step is to work out how to log and graph the data..
Just a quick note: In order to collect data with Freedomotic it looks like you need the Harvester plugin (or an adaption of it). You can write on Freedomotic mailinglist for any request! Thanks Matteo. An adaptation of the Harvester plugin may just do the job. I am looking to remote log/store/graph in order to keep the Freedomotic node lightweight and think that the emoncms system may do the job for storage.